Our Memorial Organ enhances our worship and music-making. 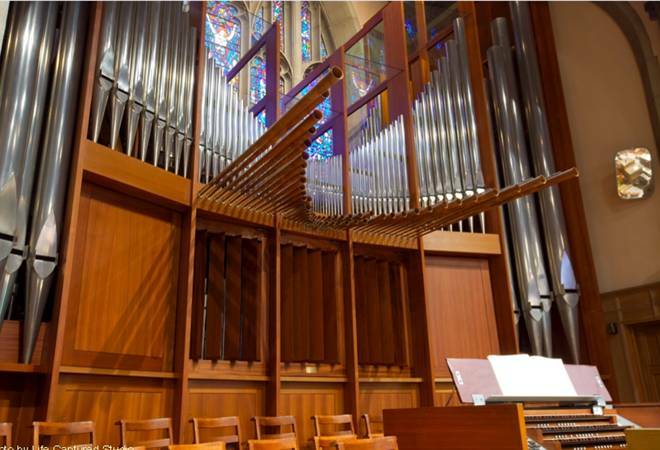 Built by Rieger of Austria and installed in 1975, it is a three-manual, 40-stop (50-rank) tracker organ containing over 2,500 pipes, encased in wood and glass. It was dedicated to the glory of God and to the service of the entire church and community, with the understanding that it be made available for workshops, recitals, concerts, competitions, demonstrations, practice, and lessons, in addition to leading worship. In 2000, it underwent a major cleaning and refurbishing, including the addition of three 32’ digital pedal stops by Walker. Other musical resources include the rebuilt 100-year-old Steinway grand piano Model B in the sanctuary (a fine, recital-quality instrument), other pianos, a 7’ harpsichord (in the style of a 17th century Italian harpsichord), a Kurzweil 88-note electric keyboard, a pair of Ludwig timpani, Deagan symphonic orchestral chimes, a collection of Studio 49 Orff instruments, a pair of full-sized congas, and various percussion instruments.